Through our website, members have access to over 10,000 academic internal medicine professionals, allowing networking, collaboration, and sharing of best practices to take place. Features include discussion forums and document libraries as well as a searchable member directory. AAIM fosters education innovations in academic internal medicine with a seed grant program. Grants of $2,500 or $5,000 are awarded for eligible proposals. AAIM Connection, a weekly email, and Academic Internal Medicine Insight, a quarterly publication, serve as the voice of AAIM, highlighting current activities and initiatives affecting academic internal medicine and providing policy, meetings, and member services updates, as well as the publication of member editorials. AAIM offers a variety of publications for every aspect of internal medicine. Publications are available for all individuals from a department of medicine, whether faculty, physicians-in-training, or staff. 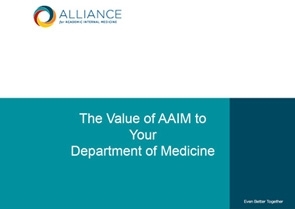 AAIM and its member organizations actively engage in policy efforts, including educating members of Congress and federal agencies and working with non-governmental regulators while addressing a wide array of issues ranging from accreditation of training programs to preparation of physician-scientists, funding for medical education, and increasing the diversity of the physician workforce. AAIM provides members with unique educational opportunities throughout the year that are designed to enhance our members' professional knowledge while remaining up-to-date on relevant issues. Academic Internal Medicine Week and the Skills Development Conference provide networking opportunities with colleagues across associations. Most meetings offer CME credits and the opportunity to submit workshops and abstracts. Members also save money with a discounted registration rate for meetings! AAIM and the founding member associations maintain series of standing and ad hoc committees, task forces, and work groups. These committees represent important core work areas and core business functions relevant to AAIM. AAIM and its member associations honor members of the academic internal medicine community for outstanding leadership and service with 14 awards throughout the year. Several of AAIM's member organizations conduct annual surveys as a service to members which provide helpful health services data and set benchmarks for departments of internal medicine. A competitive solution to costly recruiting options, IM Career Source lists faculty, staff, and physicians-in-training positions in departments of internal medicine. Members received a discounted rate when posting positions. Our mailing lists provide access to mailing addresses of all members or members of a particular association. Members receive a discounted rate when purchasing mailing lists.